So far the newspaper industry in the US has cut over 14,000 jobs this year. Paper Cuts is a Google Map showing where in the country these cuts have been made. 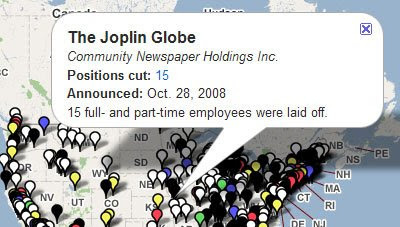 The markers on the map are colour coded depending on the number of job cuts made at that newspaper. Clicking on a map marker opens an information window with the name of the newspaper, the number of positions lost and the date that this was announced.